Have you ever been to a meeting or a get-to-know-you event where they have an ice breaker to state your name and tell a little bit about yourself? But I am here to remind you that you ARE enough. The most important thing is WHOSE we are; who God says we are. And folks, He says we are His. Listen to this song and be reminded…. This entry was posted in devotional, inspirational, motivational, spiritual on August 30, 2018 by Deanna Young. How Many D’s are in the Alphabet? Yes there were that many “D-Days” in just the first two generations of Kelly & Erasta Day’s family. Naming your children with a “D” in the Day family must have been a very popular thing. We even have cousins Diane and another Darrel but with last names starting with “H” instead of “D”. Throughout my lifetime, I’ve always been asked if I was a member of the other “D-Day” clan. Sometimes I would get angry if we were teased about it while other times it was so exciting to be a part of a big D-Day team. But Friday, during the original D-Day’s funeral (my Uncle Dale), I was reminded how cool it is to be a part of such a big family. I sat and listened to testimony after testimony of how my Pastor uncle had touched what could be thousands of lives by a ripple effect of over 60 years in ministry. There were writings in papers and magazines and emails that stretched all the way to Australia. He was called by the Lord and took that calling seriously. There was no rest for him. 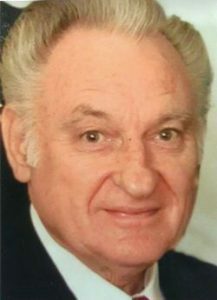 Whether he was preaching a revival in another town or witnessing in his own, he would make it his mission to go and knock on doors and visit as many people as possible because all he cared about was telling people about Jesus so they, too could spend eternity in heaven. Story after story of his witnessing. A legacy I want to continue. He will be missed by many as hundreds rolled through that funeral home viewing and sat in those pews for a wonderful celebration of his life. And I realized another emotion popped up in my heart. Honor and thankfulness. Yes, I am honored and thankful to be a D-Day. This entry was posted in devotional, inspirational, motivational, spiritual on August 27, 2018 by Deanna Young. Ever been driving along at your own rate of speed and see a police officer then slam on your brakes? It’s an automatic reaction even if we aren’t going over the speed limit. I imagine police officers sitting in their cars just laughing as people panic when they see them parked in that “can’t go through this path” slot in the interstate median. We push our luck lots of time hurrying up just a few miles over the “suggested” speed limit and before we know it we are 10 or more over and there’s the cops! YIKES! Sometimes I even feel like I’m in a movie as I look around in paranoia as every underpass approaches. Where are they now? We try to outsmart them. I bet they will be hiding in this pass-through up here between the two hills. I bet one’s in the air with a speed gun radioing down to the one on the ground hidden in the trees covered with branches camouflaging themselves until they can appear out of nowhere with a “gothcha ticket”. Sometimes we get by with a warning. Sometimes we avoid the punishment of getting stopped all together and sometimes we have to pay the price of a hefty ticket. Isn’t it awesome that God sees all we do and He’s not just sitting there waiting to punish us. He already paid the price of us getting caught. Our nature is to sneak around and break His rules and stay on the lookout to make sure no one’s watching. We hide behind perfectly groomed yards and houses, church pews and Bible studies. Social media can make our lives seem like the perfect dream. But God sees all. And I’m sure He is disappointed in us in some form or fashion every single day. But the good thing is that no matter how He deals with our sin, He is doing it because He loves us. We don’t need to make excuses. We just need to say “I’m sorry” and start working towards moving through life better with Him as our driver . Whatever you’re doing today that you think God doesn’t know, I’m here to pop your ego. He knows. He knows everything. But the good news is He loves us anyway and He is here to help us come out of our dark hidden places, take off the mask we are hiding behind and lead us into a beautiful journey with Him. Are you ready for this wild ride? Speed-free zone. Just hold on and watch what He can do! 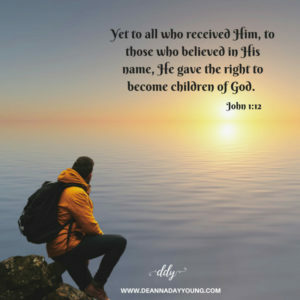 This entry was posted in devotional, inspirational, motivational, spiritual on August 24, 2018 by Deanna Young. Mr. Rogers had a bunch of them. Every kid wanted to be one to him. What is it? A neighbor. Mr. Rogers’ invitation to children began when the sweater and the sneakers came on. He was gentle and kind and made the children feel as though they were the most important people in his neighborhood. If only we could be as gentle and kind to our neighbors. I have the sweetest neighbor. She keeps her eye on our house, gets our mail and waters our flowers when we need her to. It’s so great to have a kind neighbor. 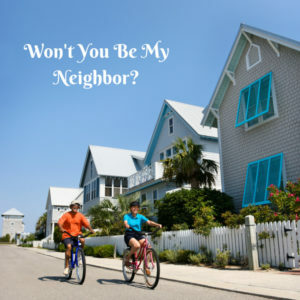 But Jesus tells us that neighbors are more than just those who live across from us. He explained in Mark 12:29-31 that the most important commandment is to love the Lord your God with all your heart, soul, mind and strength and then the second most important command is to love your neighbor as yourself. Boy, we love ourselves don’t we? We want the best for us. We don’t want to hurt or suffer. We want to have God bless us and protect us. Well, then I guess if we want to obey this command, then we need to pray for those things for others. Our prayer challenge for today is to pray for our neighbors. As we drive to work or school or walk the dog, pray for each house we pass and ask God to bless them and comfort them for the day. Whether we know them or not, they are our neighbor and God wants us to love them as much as we love ourselves. It will be amazing how focusing on others and praying for the best for them helps take our mind off of our own problems. I think Mr. Rogers had it right. We should live in one great big happy neighborhood! Pray on, my friend! This entry was posted in devotional, inspirational, motivational, spiritual on August 21, 2018 by Deanna Young.